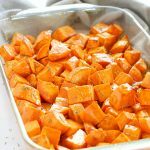 These Maple Rosemary Roasted Sweet Potatoes make the perfect healthy holiday side dish! Add the olive oil to a large rectangular baking dish. Add the sweet potato chunks and dried rosemary and toss until the sweet potato chunks are well coated. Drizzle the maple syrup over the sweet potato chunks and bake at 450 degrees Fahrenheit for about 20 minutes, or until the sweet potato chunks are soft enough to be pierced by a fork. Serve as a side dish alongside your favourite roasted chicken or turkey, ham, or any other holiday main dish.